Miria called me at 3am on the morning of the July 17th. She told me that she was having regular contractions and was trying to rest. A few hours later the contractions had gotten closer together so Mira's midwife and I headed to her house. I showed up a little bit before the midwife, Erin, got there. Mira was peacefully working through each surge. Once Erin got there, Mira worked through some contractions and Erin checked her. We were still in early labor at 3cm and baby was not in an ideal position. For the next many hours Mira did stairs and worked through many positions to work baby into a good place. Once her contractions got more intense and things moved along Mira labored in and out of the tub, and in the shower. Finally at around the 20 hour mark she laid down and tried to get some rest because she had been stuck at 7cm for a very long time. After resting some, Mira got up and again did stairs and various positions to get baby to come down, but after being stuck at 8cm for 5+ hours we had to transfer to the hospital. Once at the hospital, Mira got an epidural and Pitocin in hopes that her pelvis would relax a bit and we could get some strong contractions to finish out dilation. It worked! After 6 hours at the hospital and some amazing and quick pushing, Rosilyn Mae was born at 11:26am on July 18th. Mira and David didn't know if they were having a boy or girl; the moment they found out that they had a daughter they were filled with such joy! 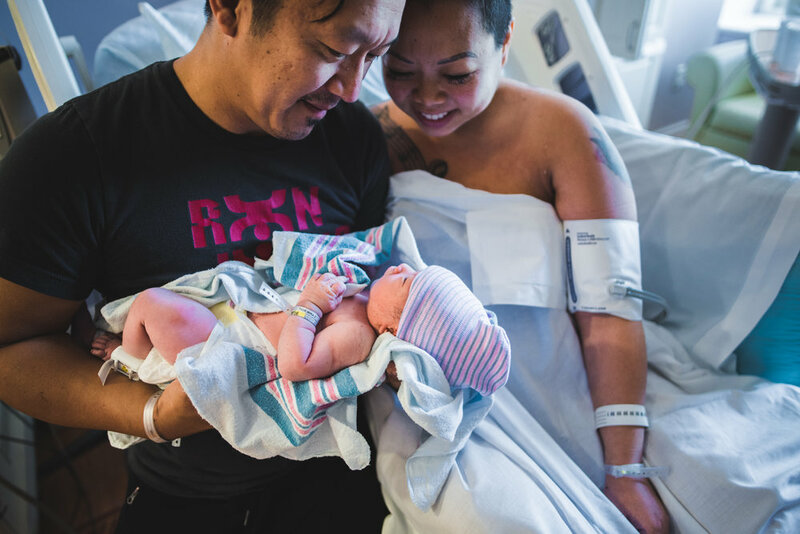 Soon after birth, Rosilyn latched on and Mira began her journey breastfeeding her little one. Throughout her entire labor, though it was very long and hard, Mira had a beautiful peace and grace about her. She trusted her body and listened to it well. Even when plans changed and she had to transfer to the hospital, she choose peace and trusted her process. It was a truly a beautiful journey to support as a doula and capture. Congratulations Mira, David, and Rosilyn on being a family of three!